Green Goddess is one of my favorite salad dressings, and also a sign of spring; I make this recipe every year as soon as the tarragon comes up in my garden! And this delicious classic dressing is low-carb, Keto, low-glycemic, gluten-free and South Beach Diet friendly! Use the Diet-Type Index to find more recipes like this one. Click here to PIN Green Goddess Salad Dressing! Have you tasted Green Goddess Salad Dressing? Green Goddess was hugely popular when I was a kid, and for me, it’s one of those blast-from-the-past things that I’ve loved for so long I don’t remember when I first tried it. There are definite similarities to Ranch Dressing, but Green Goddess is creamier and more herbal, with generous amounts of chives, tarragon, and parsley. It wasn’t until I read about Green Goddess dressing on Hedonia that I knew that the dressing originated in San Francisco, created by a chef at the Palace Restaurant in 1923 for an actor who was starring in a play called “The Green Goddess.” When I saw that post I’d been talking with my sister Sandee for months about re-creating our favorite salad dressing memory, and I finally made the dressing. I used the Green Goddess recipe from Hedonia, which Sean adapted from the original recipe from The Palace Restaurant. Of course, I loved this dressing, which I’m thinking is a pretty good reason to be sure I get some tarragon into the freezer so I can make it this winter! Let the dressing chill in the fridge for at least a few hours before serving. This will stay good in the fridge for at least a week. Green Goddess is one of my favorite salad dressings, and also a sign of spring! Measure 1/4 cup each of chives (or green onions), tarragon, and parsley, and add to food processor. Pulse processor until the fresh herbs are finely chopped, then add lemon juice, white wine vinegar, and anchovy paste (or canned anchovies) and pulse a few times more. Add mayonnaise, sour cream, salt, and freshly-ground black pepper and run the food processor about 20-30 seconds, or until ingredients are well combined. Chill at least a few hours before serving. This will keep in the fridge for at least a week, although it probably won’t stay around for that long! Recipe adapted slightly from Green Goddess Dressing from Hedonia, who adapted it from the original recipe from The Palace Restaurant in San Francisco. Green Goddess Salad Dressing would be approved for all low-carb diet plans and all phases of the South Beach Diet. 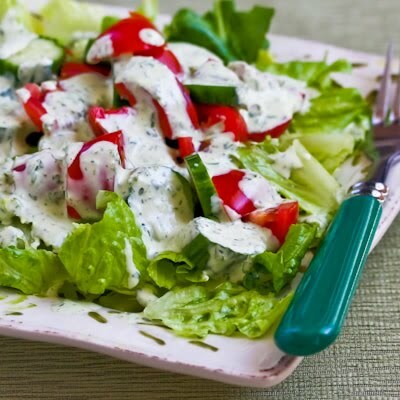 If you’re strictly following South Beach, you should use low-fat mayonnaise and low-fat sour cream to make this dressing; other low-carb eating plans would prefer full-fat ingredients. This reminded me to put anchovy paste on the shopping list. Just a smidge makes all the difference in a lot of recipes. Tarragon makes all the difference too, but not in a good way for those of us who can't abide anything with the faintest hint of licorice taste. Basil sounds like a good idea. So glad people are discovering this; I am craving it myself now! This has to be my new favourite dressing Kayla. This recipe is great! I only 'discovered' Green Goddess dressing last year, and used the 'original' recipe from the Palace Hotel. I don't use anchovies often, and a tin of them was less expensive than the paste….so I bought a tin, used what I needed, then froze the rest. (it's easy enough to cut off a chunk and thaw if you need it for something else). And I did use low fat mayo, and low fat sour cream. It turned out fantastic! Thanks, Kalyn! Valerie, I think the "from-scratch" variety is always so tasty! Lydia, what a great spring ritual. I love picking herbs out of the spring garden for Green Goddess dressing. It's kind of a ritual around here! This is one of my all-time favorite dressings! So much great flavors in this salad dressing. Adding to my list! Jen, I love that variation! Thanks for sharing. Just posted on your chicken nuggets page that we uses this as a dip. Didn't have fresh tarragon so I substituted fresh oregano and a bit of cilantro. Also threw in half a chipotle pepper Bc the mayo I had was kind of sweet. Made a really nice smoky and herby dressing. Will make over and over again. Thanks for your creations. You are inspiring. Ms. b, thanks for reporting back! That will make this recipe much more useful for winter. I did make this with dried tarragon, only made 1 cup adding 1/2 T tarragon. It was delicious and had a very subtle tarragon taste. I think next time I will try adding a little more. I remember that dressing! I still have lots of tarragon and chives. Have to use Greek yogurt rather than the sour cream tho…. Just as good, I bet! I think if the dressing sits in the fridge long enough for the dried tarragon to release some flavor it might be okay, although I might just make it without tarragon if you have the other ingredients. Let us know how it works with dried tarragon if you try it. I love tarragon but don't have any fresh, do you think a small amount of dried would work? No, sorry I was not clear. The avocado was blended up in the dressing, which had basil instead of tarragon and most of the ingredients were the same as this recipe. (Think it might have been Ina Garten recipe, but not sure.) May have to find it and try that version! that sounds like a winner too!..so the basil would go into the dressing instead of the taragon…and the salad would consist of tomatoes and avocado? Kate, so glad you liked it! I'm a tarragon fan as well, but I do think it's a strong flavor that not everyone likes, and for people who don't like it or don't have fresh tarragon, I think the dressing would still be good without it. I saw a variation of this that uses avocado and basil that also sounded good to me! Thanks Louise, it was scorching here too the day I ate that salad! This looks great! I can't wait to give it a try. Your photos are beautiful. Andrea, I do think it will be okay without the tarragon, and you've convinced me I should add "optional" without it in the recipe list! Mmmm, that salad looks amazing! Oh I do love green goddess dressing. We always had some at home when I was growing up. Haven't had any in years, so it's time to remedy that situation! I don't have any tarragon in the garden because it never took, but it'll be fine without it, I think. Susan, I think the dressing would still be great without the tarragon (Duh, I should probably list it as optional in the ingredients, huh?) I am really loving the Green Zebra tomatoes. I think having them by the deck where it's sunny all day long has made a lot of difference. LOL I've been meaning to make this dressing since I saw it on Hedonia. The tarragon plants I mail ordered last year died, but I wasn't all that crazy about the flavor anyway. I'm betting it would still be delicious without it – traditional or not! CJ, thanks! I love it too. No idea why it has taken me this long to try making it. I love Green Goddess dressing. Love it. Just came in from a scorching afternoon and when I saw that photo of the cool, crisp salad with my favorite dressing…. I could eat that picture.